Rhinoplasty is an overall term used to describe a range of surgical procedures, which may be used to re-shape the nose, or correct nasal deformities to relieve blockages. Cosmetic rhinoplasty or a nose job usually refers to surgery which reshapes the cartilage, bone and sometimes soft tissues of the nose, to produce an appearance more pleasing to the person, whilst maintaining correct function of the nose. Nose surgery can increase or reduce the size of your nose, straighten a lump on the bridge of the nose, change the shape of the tip or the bridge, narrow the nostrils, or change the angle between your nose and your upper lip. The operation can be performed under a local anaesthetic; although some people are given sedation via an intravenous drip, or a general anaesthetic may be used. Most people find that they can go back to work one to two weeks after surgery, and it will take several weeks before normal activity can be resumed. Private costs for nose surgery can range from approximately £2,000 - £3,500. Rhinoplasty is an overall term used to describe a range of surgical procedures, which may be used to re-shape the nose, or correct nasal deformities to relieve blockages in the nose. In common terms, a “nose job”! The nose consists of two basic components: bone and cartilage. The bone supports the upper part of the nose, while the lower part of the nose is supported by cartilage. Inside the nose is a hollow cavity, called the nasal cavity which is divided into two sections or passages by the nasal septum (the bit dividing the two nostrils). In some people, the septum becomes slightly out of line and the cartilage dividing the nose is crooked. The crooked cartilage can interfere with breathing and blowing the nose. In many cases surgery is recommended to straighten the septum, and so improve breathing, and this surgery is called septoplasty. Aesthetic or cosmetic rhinoplasty (again a “nose job”) usually refers to surgery which reshapes the cartilage, bone and sometimes soft tissues of the nose, to produce an appearance more pleasing to the patient. Your nose is the second most prominent feature on your face, next to your eyes, and its size and shape may be the most obviously defining characteristic of your face. However, when considering nasal surgery, doctors and patients must consider both the appearance and function of the nose. This is because the size of the breathing passages is sometimes reduced when the size of the nose is altered. Some experienced clinicians can also achieve a degree of nose reshaping using either temporary or permanent dermal fillers. Rhinoplasty can increase or reduce the size of your nose, straighten a lump on the bridge of the nose, change the shape of the tip or the bridge, narrow the nostrils, or change the angle between your nose and your upper lip. 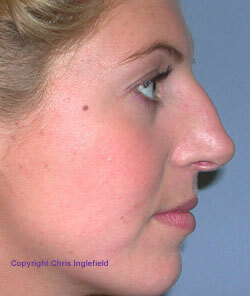 There are limitations however, and rhinoplasty does not allow you to choose a new nose from a magazine! Cosmetic rhinoplasty procedures are the 10th most common surgical procedure in the US with 38 659 operations performed in 2017, a decrease of 6.1% on 2016 figures, according to statistics from the American Society for Aesthetic Plastic Surgery (ASAPS). Similar statistics are not yet available for the United Kingdom, but our discussions with leading clinics indicate that this is a popular procedure. If you are considering a rhinoplasty, the following information will give you a basic understanding of the procedure. It can't answer all your questions, since a lot depends on the individual patient and the surgeon. Please ask a surgeon about anything you don't understand. What happens during a Rhinoplasty operation? Careful discussions regarding your reasons for wanting nose surgery are very important at this stage. Make sure that you obtain as much information as is necessary to enable you to make a fully informed decision about whether to go ahead with rhinoplasty surgery. The surgeon should also ask for your medical history, to make sure that there are no reasons why you shouldn’t have a rhinoplasty. At this point, you would also normally be asked to read detailed information and sign a consent form, which means that you have understood the future benefits and possible risks associated with the procedure. Photographs of your nose may also be taken by the practitioner for a “before and after” comparison later. The operation can be performed under a local anaesthetic; some patients are given sedation via an intravenous drip, or a full general anaesthetic may be used. The operation can take between 1 - 2 hours, but depending on the extent of the procedure, it can take longer. If you are having more than one procedure, you may be required to stay overnight. The surgeon often cuts the skin inside the rim of the nostrils to avoid any visible scars. However, for more complicated operations an "open" technique may be used where a small cut is made across the base of the nose on the strip of tissue that separates the nostrils. This "open" procedure may result in a small scar on the underside of the nose, but it can make it easier for the surgeon to operate in more difficult cases and it will be quite difficult to see the scar afterwards. During surgery, the soft tissue of the nose is separated from the bone and cartilage underneath the skin. Then the bone may be broken and repositioned and the cartilage reshaped to achieve the look you require. A splint is applied and the nostrils are packed lightly with medicated gauze. If the nose is not being reduced in size, then the nose is only taped while it is healing and stitches are not required. If stitches are used to close internal wounds, they will dissolve automatically and will not require removal by a doctor. If a cut is made across the skin separating the nostrils, then the stitches may need to be removed. In about one case out of ten, a second minor procedure may be required, for example, to correct a slight deformity when the nose still looks slightly misshapen in some way. These relatively rare problems are unpredictable and can happen even to patients in the hands of the most skilled surgeons. How long will it take to recover from a nose job? Most patients find that they can go back to work one to two weeks after surgery. It will take several weeks before normal activity can be resumed, and the patient feels like himself or herself. What are the risks and potential complications from Rhinoplasty surgery? Patients will experience swelling of the eyes, nose, and sometimes face, after a rhinoplasty operation. The inflammation may last for a couple of weeks. If the nasal bone was broken, some blackening or bruising around the eyes may occur. You will feel some discomfort in your nose, and some patients may experience headaches during the recovery period. Some bleeding is considered normal after surgery. However, if the bleeding is heavy or uncontrollable, gauze may be put in the nose to stop the bleeding or any dressing already in the nostrils will have to be changed. As with all operations, there is always a possibility of risks or side effects and, following rhinoplasty, these may include infection, nose bleed, a reaction to the anaesthetic, nerve damage and the occurrence of or irregularities such as a “lop-sided” nose. As the skin swells after the operation, this may disguise or hide irregularities or deformities that become apparent after the swelling has gone down. Unpredictable healing of bone and cartilage can also cause irregularities, which can appear weeks or months after surgery. These irregularities may be just felt by the patient or may also be visible on the nose. Very rarely a slight reddening of the skin may occur - this is more likely if you have had a previous rhinoplasty. What should you do after a Rhinoplasty operation? some doctors recommend compression exercises to help reduce swelling and keep the "narrow appearance" of the nose. With compression exercises, the patient sits in from of a mirror and presses the nasal bones together with the index fingers. The "pressing" should be held for a minute at a time, and should be conducted several times a day. Who should not have a Rhinoplasty operation? Only fully trained and qualified surgeons should perform a rhinoplasty operation. These would normally be plastic or cosmetic surgeons and ear, nose and throat (ENT) specialist surgeons. It is becoming increasingly unlikely that anyone considering cosmetic nose surgery would be able to access this free of charge on the National Health Service. Prices for a private rhinoplasty operation can range from £2,000 - £3,500 depending upon the type of surgery required. Cosmetic rhinoplasty seeks to improve the appearance of your nose but is not a guarantee for happiness and success in all aspects of your life. You should have realistic expectations and accept that there are limits regarding what nose surgery can achieve physically and emotionally for you. 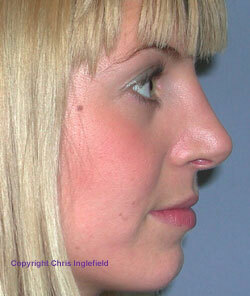 Most patients with this reasonable attitude experience a positive outcome following a rhinoplasty by a skilled surgeon. Some people, however, may be dissatisfied at first with the appearance of their nose following a rhinoplasty. That is why it is very important to be patient as your appearance will change significantly during the first three months and it can even take a year or two to see the final results of the surgery. Rushing to have a second operation on your nose before a full year has passed is almost always a mistake. 27 year old patient, requested bump reduction. Nose before rhinoplasty surgery and 6 months after. Click for ALL Rhinoplasty clinics in the UK & Ireland registered and verified by Consulting Room.